Since Amazon.com sometimes has the best prices and provides 24-hour shopping with quick shipping, we wanted to remind readers that Power Paws are available in the Woodrow Wear Amazon Store. Power Paws make movement easier, increasing quality of life. 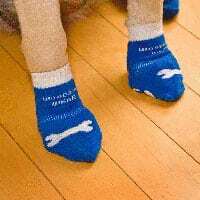 Similar to non-skid slipper socks for people, Power Paws protect both your dog and your hardwood floors. 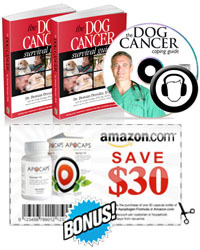 Eliminate scratches in fine flooring while protecting your dog from painful injuries caused by falling. For outdoor use, Power Paws can be helpful for short term use in summer and winter conditions. In winter snow and ice, Woodrow Wear suggests spraying Power Paws with a couple coats of waterproof spray. Let them dry completely, then enjoy the outdoors with your dog! For summer conditions, even the hottest pavement does not affect the grip, and the sock is thick enough to protect paws from heat. 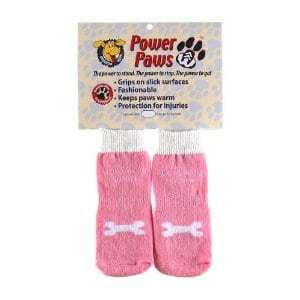 Power Paws dog socks are machine washable. For permanent protection and ultra-durable traction outdoors, consider Ruff Wear Bark’n Boots for long-term use. Mobility: Freedom and movement for senior dogs and those with mobility issues. Fashionable: Cute, fun and stylish. Scratch Prevention: Keeps dog’s nails from scratching hardwood floors. Breathable: Made of cotton and elastic for comfort and breathability, so dog paws will not sweat nor stink. Specialty Uses: On boats, RVs, and in moving vehicles of all types to prevent falls and protect surfaces from scratches. Power Paws are also quite fashionable with many styles and colors available. 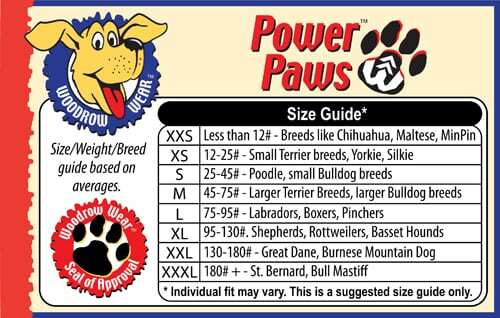 And with sizes raging from XXS to XXXL, there are Power Paws traction socks to fit any breed! For best results, download Woodrow Wear’s printable paw sizing guide and have your dog stand on it to determine proper sizing. NOTE: Greyhound breeds and poodles have physically different feet. If your dog is a Greyhound breed or a poodle, please contact Woodrow Wear directly to find a size that may work. Purchase Power Paws from Woodrow Wear Amazon Store! Visit Woodrow Wear website for more information. Want another option? Consider PAWz natural rubber dog booties for improving traction at the vet’s office or pet store! My Dog Has Fallen and He Can’t Get Up!